Twitter has been growing up. It’s now a $30 billion public company, and it means business. Twitter has changed over time, but remains a key tool for business branding and a key place for customer engagement and long-term customer relationship building. This book includes a major update 02/15/19 at the end of Chapter 12 which keeps the information particularly relevant and highly effective in view of significant changes to Twitter’s policy. You can buy the book from Amazon. 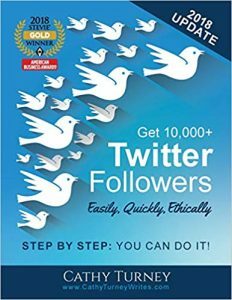 How easy it is to get 10,000 + Twitter followers – Easy, Quick, Ethical! The Best and Worst Times to Tweet – The intricacies of when (and how) to make sure your Twitter social media marketing efforts have the biggest bang for your buck to gain Twitter followers and Twitter likes.